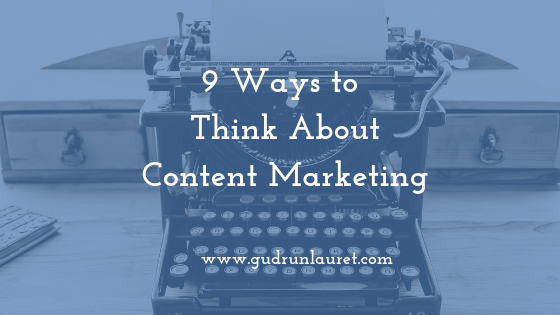 The words ‘content marketing’ often worry people, because they can’t see how it applies to their business, particularly in more traditional industries. There’s also a perception that it’s just a fad, and not a way to build meaningful relationships with customers. 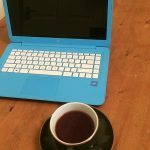 To help you think about how it might be of benefit to you, I’ve put together this list of different ways you can think about content marketing. I guarantee at least one of these will be relevant for you. Whether your business is established or just starting out, there will be questions that current and potential customers have for you. Compile a list of your most frequently asked questions, and create a blog or video to answer each fully. If you sell products, talk about shipping, packaging, returns and payments. If you’re a service-based business, describe the process you use to put together a client brief, your delivery terms and what the customer can expect from you. Once you start the list, you’ll probably come up with loads of questions to answer. This is your opportunity to go further into some of the customer questions you’ve identified. If you’re a graphic designer, talk about the tools you use to create a logo or brochure. If your consultancy can help them double their turnover in 12 months, talk through how you do this. Create a behind-the-scenes video to give people an idea of your process (without giving too much away! ), a tour of your factory or workshop, and if you have employees, feature them too. If you think what you do is complicated or technical, use this as an opportunity to simplify the way you explain it. Produce a series of videos or blogs if necessary, so you can go into plenty of detail. Who are your products and services designed for? Tell a story about your product so your target audience can relate to it – if you’ve come up with something to help busy mums, make sure they know it’s for them. People think that content marketing requires putting together lengthy blog posts or professionally shot and edited videos, but content is anything at all you create to share with people to improve their business or professional lives. Send out a newsletter with a top parenting tip, or film a 30 second video on your phone to share on social media. You might have come across the term ‘pain points’ when you’ve read anything about content marketing. This is about understanding the problem your customer has and how you can solve it. It could be a real problem such as the car not starting, or it could be a desire that they have, such as wanting a new suit or handmade shoes. By showing that you understand those needs and how your product or service can help them, your customer sees that they can trust you to help them with that pain. Create content that digs deeper than just the surface issue – what does it mean if the car won’t start? Perhaps it’ll mean that they’re late for work, they can’t take their child to a music lesson, they can’t buy shopping for a relative. How can you help with that? The ease of being found by potential customers online unfortunately means that your competitors can be found too. Putting in the time to create content that explains what you do and how you can help customers helps them get to know you better. Giving them helpful information, showing them behind the scenes of your business and clearly communicating what your brand is and what it stands for all helps customers to build up an image of you, one that’s distinct to your competition. If you’re top of mind when they’re ready to buy, they’ll choose you. Providing the types of content we’ve discussed above, and giving it away for free, demonstrates that you’re an expert in your industry and niche. You write or talk knowledgeably about your offering, demonstrating that you’re the best person to provide it. If you want to talk about your qualifications, experience and industry acknowledgments, do so sparingly. These things can help build trust, but an audience always wants to know how that helps them, the focus of all your marketing efforts. The About page or an FAQ page can be a way to talk about these things, and of course for regulated industries you do need to show accreditations. If you win an award, talk about in terms of how this will help customers – perhaps the recognition means you can get funding for a new website to offer online shopping. Case studies and testimonials are a great way to demonstrate your credibility and expertise in the industry. If you can get your existing clients to create the content for you, in video testimonials or a few short sentences, that’s even better. A case study allows you to share a real-life example of a problem someone had, the steps you took to resolve it and what difference that made to their business or personal life. You can anonymise these for confidentiality, or even combine two different stories to illustrate a whole process. Social media is ideal for engaging directly with your customers. As well as sharing your content on the platforms your audience is using, take advantage of the two-way aspect of Web 2.0 and start conversations with your customers. Encourage them to ask questions, maybe as a live Q&A broadcast, or get them to contribute to your FAQ. Run competitions where you ask people to send photographs of themselves using your product, talk about what they like about your services or offer a discount or incentive. And always be proactive about any feedback you get. Remember one of the key factors for content creation – does it answer the ‘so what?’ question? Talk about industry changes or the latest legislation in terms of how it impacts your customers. In the UK, businesses have had to review their data security and storage policies in line with GDPR (General Data Protection Regulation), which was discussed in business forums, on websites and across social media. Likewise, Twitter’s recent crackdown on multiple accounts and repeated content has also caused some problems. If you’re in a regulated industry or one which relies on the latest technology, keeping your audience aware of recent (and even better – upcoming) changes that could affect their business or their own customers is a great way to use content marketing. 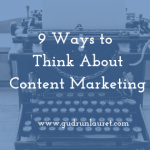 You might also find these posts helpful: What is Content Marketing? 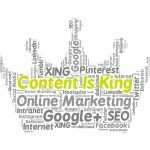 and Is Content Marketing Right for my Business?